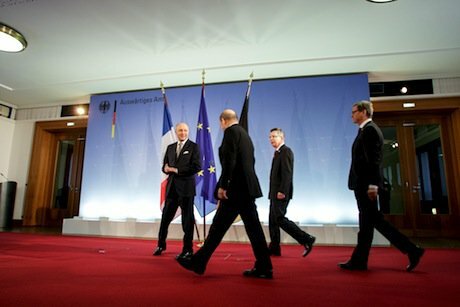 The eurozone crisis has marginalised the attention devoted to the EU's foreign policy capacity. As member states argue over the merit of financial stability and rescue mechanisms to bail out debtor sovereigns, and debate the need for fiscal integration and reform of the EMU, the EU’s global impact weakens. It does so for two reasons. The first is obvious: a vulnerable single currency weakens the competitiveness of the single market; a less competitive single market weakens the foreign policy of a polity which is dependent – to a great extent – on its commercial prowess to be able to influence. The second is less obvious but equally harmful to EU interests: the severity of the internal financial crisis, and its inescapable political and social consequences, has resulted in a heavy dose of ‘Euro-introspection’. Europe is turning away from the world as it is consumed with its internal arrangements and future prospects for European integration. This introspection is the result of a return of the core question to the European project: how far do sovereign member states want to push the federal agenda? Is fiscal union needed or even desired, and how far does this push us down the line of political union? This perennial dichotomy between sovereign state interests and the growing power of a supranational Union has also always been at the core of the EU foreign policy debate. Today is no different. Europe’s ability and need to conduct foreign policy is being severely restricted by an existential debate which reinforces the existing reticence of member states to ‘lose control’ of the foreign policy sphere. It has always been thus. European Political Co-operation (EPC) was launched in the 1970s as an intergovernmental process outside the confines of the treaties. Member states were moved to begin a dialogue on the role of the EC in the world, and an exchange of information and views about their views and interests on foreign policy matters, just as the EC was emerging as a growing presence on the international stage following its increasing commercial stature. But progress was slow and integration limited: it was clear that foreign policy remained within the ambit of the state. While co-operative policy making processes were proposed, foreign policy meetings became regularised, and certain common positions on external matters were achieved, foreign policy still seemed to be beyond the reach of the ‘European project’ as states wished to keep control over a policy area deemed vital to ‘the national interest’. The great transformation which occurred at Maastricht was that EPC was supplanted by the Common Foreign and Security Policy (CFSP), as foreign policy was brought within the Treaty system and many of its workings were institutionalised within the Union. Nonetheless, the basic tension between state and Union in foreign policy persisted, and the EU had to be built around the pillar structure, allowing member states to retain a veto right in a system which operated (and still does) on the principle of unanimity. The Lisbon Treaty modified this approach, reformed the pillar structure drawing Commission and Council closer together and creating the External Action Service (EEAS), beefed up the defence and security dimension of the Union, linking it more closely with the narrower foreign policy dimension, and pursued changes in the mechanics of decision-making, building on previous treaty reforms at Amsterdam and elsewhere. This brief historical digression is merely there to reinforce the view that state sovereignty is still a core issue in the EU as it is evolving today. It has always been so in terms of foreign policy, and the current ‘introvert EU’ only emphasises the centrality of this principle to the European project in both its internal and international dimensions. The relationship between national and EU foreign policy systems has been a core issue in almost every Treaty since Maastricht as it highlights the sovereignty issue and its centrality to European integration in general. Some would argue that the EU is limited as an international actor exactly because states are reticent to hand over sovereign rights to a central foreign policy decision-making authority - thus limiting the scope and power of the EU to act. The need to seek consensus is not only time-consuming but also a hostage to fortune, increasingly so as the EU enlarges and multiple actors and interests are introduced. But there may be at least two other useful ways of explaining the limitations of EU foreign policy and the relationship between national and European levels of foreign policy making, beyond the state sovereignty model. The first is to suggest that one of the core limitations to the development of a coherent, consistent and potent European foreign policy is that it is not always clear that there exists a consensus on the need for a an expansive issue-based or geographic foreign policy. Essentially what is at stake here is a perpetual tug-of-war between those who envisage the EU as having a global reach and hence global ambitions, and those whose interests are geopolitically limited and take a more parochial view in European foreign policy terms. In the first camp we may place both states with a ‘global past’ (the UK, France) and those who see a point in pursuing a ‘values’ based foreign policy which is universally applicable. In the second camp, we may find an array of ‘smaller states’ (Greece, Lithuania) whose interests are regionally limited and, more importantly, a ‘big power’ such as Germany which has struggled in historical terms to define its global interests and which has focused more narrowly on regional geopolitical and economic concerns. Of course, this tension is further exacerbated at a time when the EU is going through a bout of strong self-examination and Germany is the key player in the definition of a new European agenda. The second option is to say that apart from the global/parochial dichotomy linking national/European foreign policy systems, one also has to contend with the other perennial point of discussion which is the divide between 'Europeanist' and 'Atlanticist' states. This, of course, was a key distinction in the Cold War era, but it has persisted throughout the post-1989 period (often resulting in blistering rows such as Iraq 2003), and becoming meaningful again in the context of Common Security Defence Policy (CSDP) and the relationship between Europe and the US in terms of military capabilities and interventions (as exemplified by the Libya case). Some states see their foreign and security interests best served through an autonomous European capability while others prefer the authority and flexibility provided by a strong transatlantic component to foreign policy. What is at stake is not only Europe’s ability to act, but the rights of states to choose with whom they wish to act in concert in the pursuit of rights and interests: sovereignty remains an issue but in a very specific way. The relationship between national and European levels of foreign policy-making have always been characterised as being blocked by the persistence of state sovereign rights. Multiple reforms in various treaties have created elaborate policy mechanisms and procedures to overcome this basic tension – still, it persists. Indeed, some would argue that European foreign policy is essentially a ‘procedure masquerading as a policy’. But, in reality EU foreign policy has been more than that, however much it may be stymied by competing national interests and a cumbersome decision-making machinery. In terms of trade and development aid, the EU is a key international actor; enlargement has given it tremendous leverage in regional terms, and morally if not diplomatically many hold high expectations of the EU internationally. Militarily, or in terms of its ability to influence its neighbourhood in North Africa, the Middle East or the Caucuses, let alone build meaningful ‘strategic partnerships’ with the BRICS (and other ‘emerging powers’), the EU has been less successful. What is clear is that in all these cases the current internal EU crisis is a debilitating factor. While the EU debates its future, and the core issue is yet again sovereignty, its foreign policy influence wanes through a combination of uncertainty and neglect.